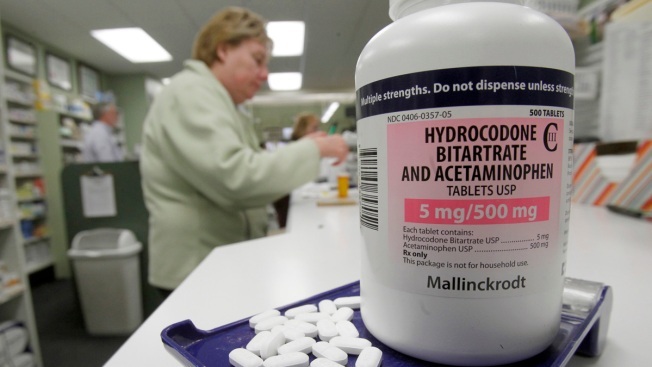 Hydrocodone pills, also known as Vicodin, are arranged for a photo at a pharmacy in Montpelier, Vt. on Tuesday, Feb. 19, 2013. People who abuse the most frequently often doctor-shop; more than 1 in 4 who used these drugs almost daily said they had been prescribed by one or more physicians. Almost as many said they got them for free from friends or relatives; only 15 percent of the most frequent abusers said they bought the drugs from dealers or other strangers. Those abusers "are probably using at much greater volumes and simply asking a friend for a pill now and then is not going to be sufficient," said Dr. Leonard Paulozzi, a researcher at the federal Centers for Disease Control and Prevention. Paulozzi and CDC colleagues analyzed four years of nationwide health surveys on nonmedical use of pain relievers including oxycodone and hydrocodone. These include the brand-name pills OxyContin and Vicodin, in a family of drugs called opioids — chemically similar to opium. The study was published online Monday in JAMA Internal Medicine. But previous CDC data show overdose deaths involving these drugs more than tripled from 1999 to 2010, with more than 16,000 deaths that year. By contrast, overdose deaths that involved heroin and cocaine totaled less than 8,000, and deaths that involved often-abused prescription drugs that include anti-anxiety medication totaled about 6,500. A separate study in the same journal presents Tennessee — among states hardest hit by prescription drug abuse — as a snapshot of the problem. From 2007 through 2011, one-third of Tennessee's population filled an opioid prescription each year, the study found. Nearly 8 percent had used more than four prescribers and these abusers were more than six times more likely to have fatal overdoses than the least frequent users. The larger nationwide study included data from annual government health surveys for 2008-2011 that included questions about use of these powerful painkillers. "Nonmedical use was defined as use without a prescription or use with a prescription for the feeling or experience caused by the drug," the researchers said. Paulozzi said the data don't indicate whether friends and relatives who offered free drugs shared their own prescriptions or had obtained the medication in some other way.